Google this morning announced a new feature for those of you who use Google Product Listing Ads, Shopping Campaigns. This is a welcome addition if like to keep things nice and orderly because it streamlines how your organize, bid and report on your Product Listing Ads. Here's a quick YouTube video describing this new feature and below is the complete announcement from Google. 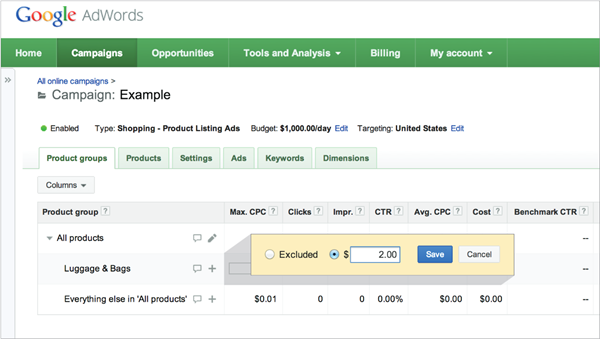 This is a welcome addition to Google AdWords, we hope you enjoy it. Shopping campaigns are an intuitive way to manage your Product Listing Ads (PLA) and sell your products on Google. With this new campaign type for PLAs, you can browse your inventory and group which products you want to bid on, all in AdWords. You’ll also have advanced reporting and optimization features to help you measure the performance of your products and estimate your growth opportunity. Follow the steps to create a Shopping campaign. Enter a maximum cost-per-click bid for all your products. Subdivide your inventory into product groups so you can set different bids for different products. - Click + to view the different ways you can create a product group. - For each product group you create, enter a maximum cost-per-click bid. - Create a Shopping campaign and product groups for the products you want to promote. - For everything else, choose to exclude them from participating in AdWords ad auctions. - In your Shopping campaign settings, change your campaign priority to medium. This will prioritize the Shopping campaign above your regular PLA campaign. Once you’ve completed these steps, you’ll have an active Shopping campaign and an easier way to manage and optimize your PLAs. Organize your inventory by creating product groups with the product attributes in your Google Merchant Center data feed, like Google Product Category, product type, brand, condition, item id, and custom labels. Use multiple product attributes to subdivide each group further and create more granular product groups. Custom labels are a more advanced product attribute in your data feed. They’re another way to identify products and create a product group. For example, you can use a custom label for best-selling products or on-sale items. To create a custom label, add a field to your data feed starting with “custom label 0”. Each product can have up to five custom labels, so additional fields should be named “custom label 1”, “custom label 2”, and etc. Campaign priority is a campaign setting to tell Google which campaign is the most important. There are three campaign priority settings, “low”, “medium” and “high”. All campaigns are automatically set to “low”. This includes regular Product Listing Ads campaigns. If you’re an advanced user and want to use Shopping campaigns to promote a subset of your inventory, refer to step 3 to help you get started.